At Bob Jones RV, we have extensive skill in recreational vehicle body and repair. With over 20 years experience, we can get your RV in just-like-new condition. 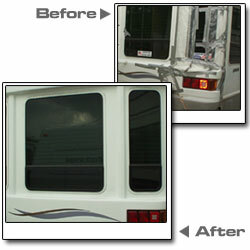 We also offer renovations to upgrade your existing RV with current accessories and amenities. Find out more in our Services Section. Better yet, give us a call at 713-910-2949 and one of our knowledgeable staff members will assist you. Just added a secure online shopping catalog with hundred of parts and accessories for your RV!. Your purchase can be picked up in our store or delivered to your home, office, campground or any other location in the United States. To start shopping click the Shop Online Now above or click here: Go Shopping Now! © 2019 Bob Jones RV.